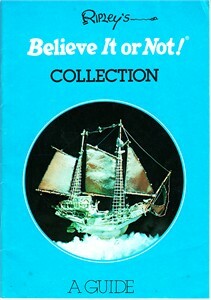 Original Ripley's Believe It or Not! Collection Guide booklet, about 6 by 8 1/2 inches with 62 pages. Copyright 1978. This booklet was sold as a souvenir at Ripley's Museums. Has minor to moderate flaws and wear. ONLY ONE AVAILABLE FOR SALE.